Definition at line 90 of file ndr_fullpointer.c. 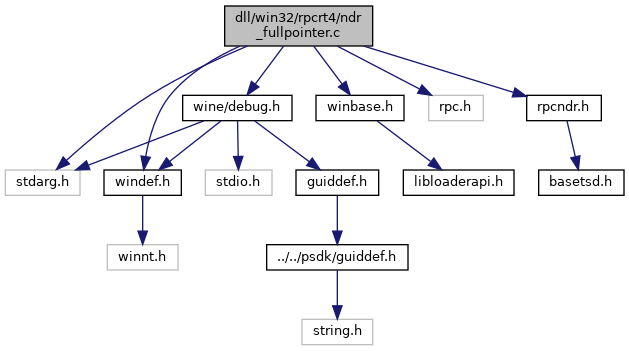 Referenced by NdrFullPointerInsertRefId(), NdrFullPointerQueryPointer(), and NdrFullPointerQueryRefId(). Definition at line 214 of file ndr_fullpointer.c. Referenced by PointerFree(), and test_fullpointer_xlat(). Definition at line 188 of file ndr_fullpointer.c. Referenced by PointerUnmarshall(), and test_fullpointer_xlat(). Definition at line 109 of file ndr_fullpointer.c. Referenced by PointerBufferSize(), PointerMarshall(), and test_fullpointer_xlat(). Definition at line 158 of file ndr_fullpointer.c. Referenced by PointerMemorySize(), PointerUnmarshall(), and test_fullpointer_xlat(). Definition at line 64 of file ndr_fullpointer.c. Referenced by ndr_client_call(), NdrMesProcEncodeDecode(), NdrpCompleteAsyncClientCall(), NdrStubCall2(), and test_fullpointer_xlat(). Definition at line 32 of file ndr_fullpointer.c. Referenced by ndr_async_client_call(), ndr_client_call(), NdrMesProcEncodeDecode(), NdrStubCall2(), and test_fullpointer_xlat().